Rooms. Conferences. Catering. Truck Rentals. Book Now For Arviat! Book Now For Arviat! Staff & Management, we gladly welcome you! We have 2 locations to serve you better. Same great service, amenities and attention to detail. Enjoy our hospitality in Rankin Inlet and Arviat. The Katimavik Suites is a family owned business, where we offer you a comfortable, friendly atmosphere in a very unique part of the world. Please click on this link and fill out form to receive more rates and brochure information! The Katimavik Suites opened in July, 2006 with 8 Suites including a 1000 square foot conference centre. Each room is beautifully appointed with a kitchenette, in-suite bathroom, Double bed, Satellite T.V., and a phone. High speed internet access is available to guests in the lobby. Wireless Internet access is also available throughout the building. Catering services are also available upon request. In 2010, we added the Katimavik beach-house located on the shores of Hudson Bay with 5 luxury suites and a common kitchen and living room. Each room has comfortable double beds, ensuite bathrooms, satellite T.V., wireless Internet. The living room has comfortable furniture and a large flat screen T.V. In 2011, we also added a duplex unit – 1 and 2 bedroom apartments as part of our hotel operations. On March 25, 2013, we opened our Newest Hotel in Rankin Inlet with a 27 room hotel. Our Katimavik Suites Hotel, Rankin Inlet features 19 studio rooms; 4 - executive suites; 4 - kitchenette suites; common kitchen, kitchenettes, laundry facilities, wireless internet, satellite T.V., and a 1000 sq. ft meeting room. 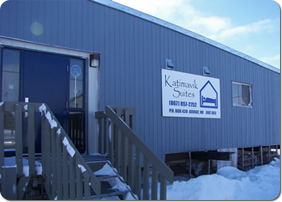 The Katimavik Suites in Arviat is conveniently located on the road to the airport close to the Community Complex, Pana Government Building, Kiluk Sewing Centre and the Arviat Housing Association. The Katimavik Beach-house in Arviat is located close to the Hamlet Office, Library and Schools. Our newest location, Katimavik Suites Rankin Inlet is located in Area 6, across the road from the Regional Health Centre, new Arena and convenient C-Store, with Tim Hortons.